This is a Login System which contains user registration and login with the same registration details. 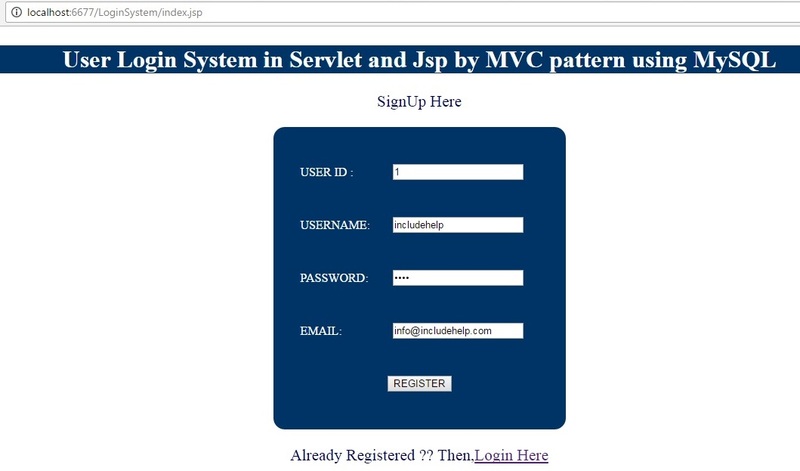 Here, we are using both the Servlet and JSP in an MVC pattern. Taking all the inputs from user and sending them to Controller Servlet in Form Action. Here we are creating DbConnection and return the Connection. return con; // we return the connection and we can get the connection wherever needed. Here we are taking all the values entered by user in Index.jsp and sending to its corresponding method save method. Here we use encapsulation technique by defining the private variables and implementing the public setters and getters to it. Here we are inserting all the details into database. This is login page, give the User id and Password which you have been registered at the registration page. Here we are taking the input values from Login.jsp and sending them to UserLoginValidate.java. Here we are validating the details which are entered at Login.jsp, if the details exist in database then it gives the total list of user details registered else it would return empty.